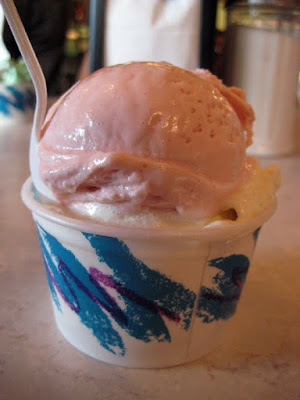 Angelo Brocato is home to the best strawberry ice cream I've ever had. When you ask a native New Orleanian for food recommendations, expect a long list. This is a city where culture is defined, in a not-incidental way, by food. It's not just the gumbo or po'boys. It's the attention to taste in everything. Angelo Brocato is a prime example. Open a good solid century before the current gelato fad took hold, this place is a frilly, adoring temple to Italian sweets. Technically, this is the "new" location, which means the location that opened in late 1905, versus the store in the French Quarter, now Croissant D'or, that opened in early 1905. It's a large place, maybe 20 small tables, and it was pleasantly packed when we arrived around 7 in the evening. 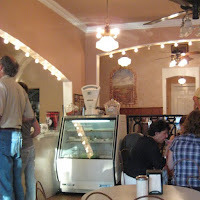 Along one wall is a long glass case, filled with Italian pastries on one side, and about 2 dozen ices, ice creams and gelatos on the other. The frozen side is mostly made up of traditional Italian flavors - chestnut, amaretto, moka, spumoni, pistacio - but they've also got the classic American standbys. The pastries looked amazing, but I was there on a recommendation, and the recommendation was for Strawberry ice cream. A small is two scoops - for me, sweet cream on the bottom, stawberry on the top. On the ice cream continuum there's Amy's Ice Cream on one side; so rich it's almost gummy. And there's places like Teo on the other - new school gelato, flavorful but almost grainy. Everywhere else is somewhere between - playing with temperature, ingredients, agitation, and presentation to try to hit the right combination of creamy lightness; the right balance between lush and refreshing. Trying to extract and incorporate the essence of something like strawberries makes it even harder. Certainly personal preference plays a part at finding the optimal point on that scale, but to me, Brocato's hit it - finding the extra depth that's missing from most Gelato and the silky texture that's missing from most ice creams. The strawberry was subtle, worked in as a flavor not as chunks of fruit, and it came through spectacularly. I ate a lot of good food in our one-day stop in New Orleans. This was up there with the best.